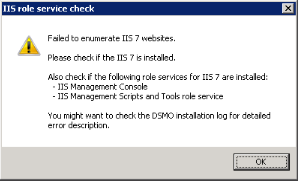 While installing DSMI on a Windows 2008 server machine you might get a warning, saying that the installation cannot continue because the IIS Management Console and/or the IIS Management Scripts and Tools roles services are not installed. Unfortunately the installation is interrupted in this case at its right beginning, since the installation depends on those services on several steps while the installation process, and can’t continue. 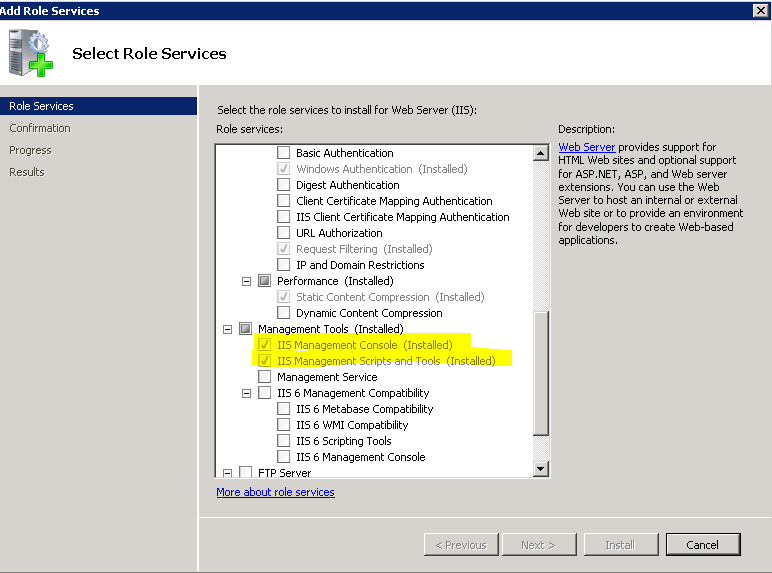 You can easily add those role services if you open the server manager, expand the Roles branch and click on the Web Server (IIS). In the right pane click on Add role services in the actions pane. In the Add Role Services wizard select IIS Management Console and IIS Management Scripts and Tools and click install. BTW, we do not need the IIS 6 support. DSMI is fully compatible to IIS 7. This enables the installation to access system properties like application pool settings and web sites in IIS. The thumbprint of you certificate (just open mmc, add certificates and double click on your certificate. Show the details pane and copy the Thumbprint value to notpad. Remove the whitespaces. Refer to this msdn page if you need more information. The other day I couldn’t attach my debugger to my web application I published to my local IIS 7 on a Windows 7 machine. To fix this on Windows Vista or Windows 7 enable Window Authentication for your web application in the IIS Manager.